Remains of burned draft records: the scene in Catonsville just after the event. 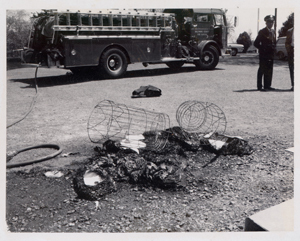 Jean Walsh took this picture shortly after the fire destroying draft records in wire baskets was suppressed by Baltimore County firemen. The fire department was called after police were unable to extinguish the burning napalm.